There’s nothing that city or state officials can do about snowfall, darkness, high winds, and low temperatures, all of which are proven to negatively impact cycling rates. And yet, we still ride. Last fall, we asked about your winter bike habits, barriers to riding, and ideas for change. A whopping 840 of you answered the call. In addition to other findings, we learned that Boston bikers are a hardy bunch. 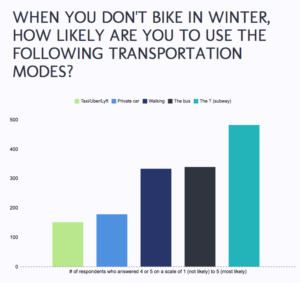 Among, respondents, 509 of you — or 61% — said they bike 20 or more days per month in the winter. The Cities and Towns of the Boston-metro region and Commonwealth of Massachusetts are responsible for providing safe mobility for all residents to get where they need to go — even for bicyclists, even in the winter. That begins with creating safe routes for cyclists, particularly more vertically separated bike infrastructure, which is proven to be the best way to entice more people to bike. And it continues with maintenance to ensure those routes remain usable in inclement weather. Although governments cannot prevent precipitation, they can mitigate how it impacts roadways and bikeways. 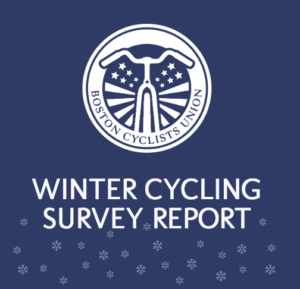 Click here to read our full Winter Cycling Survey Report. In winter, typical unprotected bike lanes adjacent to a curb or parked cars become snow storage areas. This is also true of roads without bike lanes, where bicyclists ride on the shoulder. Snow and ice also obscure bike markings, narrow the right-of-way, and force bicyclists to travel closer to — or even among — car traffic. While governments prioritize snow and ice removal of motor vehicle travel lanes (which is necessary for emergency vehicles) they often often overlook or inadequately address bike and pedestrian facilities — even though winter conditions pose the greatest hazards to bikers and walkers. Research from Sweden, Canada, and Fargo, North Dakota, shows that bad weather itself is not the biggest influence on mode choice in winter. Rather, a lack of separated infrastructure and inadequate winter roadway maintenance are higher predictors of deterring cyclists. Fortunately, transportation officials, DPW directors, and city and town councils have the power to influence both of those factors. In bad weather, biking is replaced by an increase in public transport and walking, according to academic research. Our survey confirmed that bicyclists are most likely to take the T, the bus, or to walk when they choose not to ride. Since 2000, MBTA ridership has grown nearly twice as fast as the region’s population. This has led to well-documented overcrowding on various modes of public transportation — MBTA busses, commuter rail and the T. Every person biking and walking is not using Boston’s strained public transportation system. Therefore, in order to limit further overcrowding on public transportation during winter, governments should do everything they can to make biking and walking safer and more attractive travel options. The most important way city and town councils can influence year-round cycling mode share is by increasing funding for bike infrastructure — which represents a significant political and cultural tension. In Oulu, Finland, bicycling gets 10% of the city’s road budget. In the U.S., the 2015 USDOT FAST Act allocates just 1.38% of the total spending of $305 billion to biking. Regardless of the federal budget, states, cities, and towns have the power to spend more money on bicycling infrastructure and winter roadway maintenance. Purchase small-vehicle snowplows so cycletracks and bike paths can be plowed. Classify and prioritize bikeway clearance: transportation officials should prioritize high-use bike routes and make sure they are cleared of snow and ice before morning rush hours. Lesser-used routes in neighborhoods and recreational paths can be cleared with less frequency. Design bikeways with winter clearance in mind: provide a wide bike lane buffer for snow storage. Restrict on-street parking during snow events so that traditional on-street bike lanes can be cleared. Mill pavement underneath bike markers to prolong their lifespan and help them stand up to damage from snow plows. Utilize preventative anti-icing three hours before snow events. Test organic compounds like beet juice and cheese brine as opposed to toxic chemicals for road salt. Clear sand and road grit every year before May 1st. Because so many innovative bikeway designs are brand new (bollard and flex-post protected lanes, raised cycletracks, etc. ), transportation planners, department of public works staff, and snow plow contractors are inexperienced with how to maintain them in winter. Adequate funds, training, and equipment is needed to keep bicyclists safely rolling in winter. While there is little available data on the cost-effectiveness of these methods, the decision not to act will inevitably keep year-round cycling rates low and urban travel congested for car drivers and public transportation users.